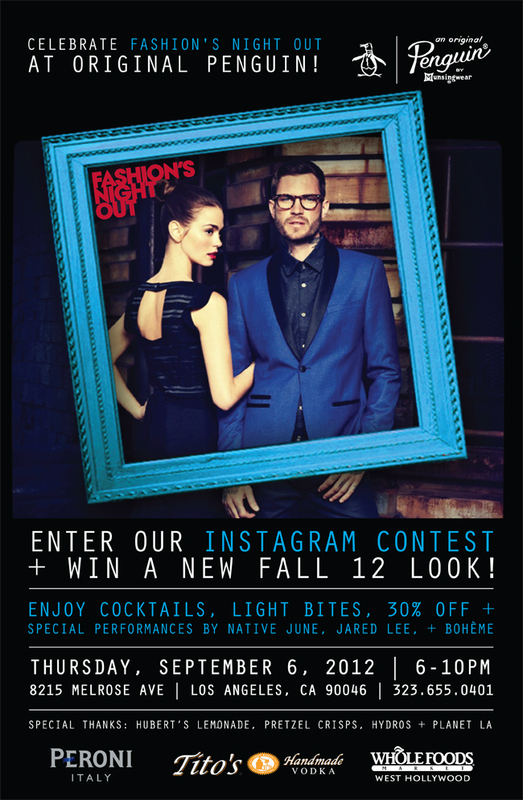 Join us for Fashion’s Night Out 2012 at the Original Penguin clothing store on trendy Melrose Ave (8215 Melrose Ave)! Thursday, September 6, 2012 from 7-10pm featuring performances by Cassidy of Bohème, Jared Lee and Native June! Snacks, beverages and goodies from our partners at Original Penguin, Whole Foods W. Hollywood, Hubert’s Lemonade, Hydros Bottle, Tito’s Vodka, Peroni Beer and Pretzel Crisps.